It is getting to be my favorite season..FALL!!! I absolutely love everything about fall, the chill in the air, pulling your quilts and boots out and it’s finally chilly enough to whip up some of those hearty, comforting, warm dinners. This time of year everyone is dusting off their slow cookers and my bloggy friend Dana from This Silly Girl’s Life and I decided now is the perfect time to share some our favorite slow cooker recipes with yall! 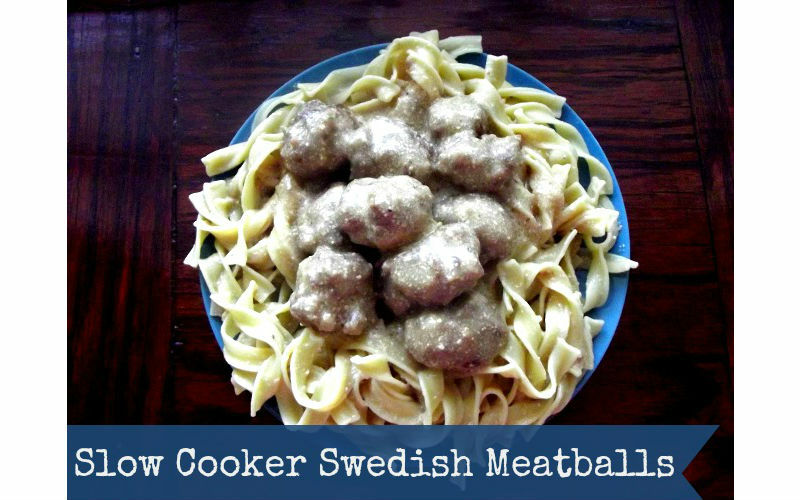 So my slow cooker recipe this week is Slow Cooker Swedish Meatballs. 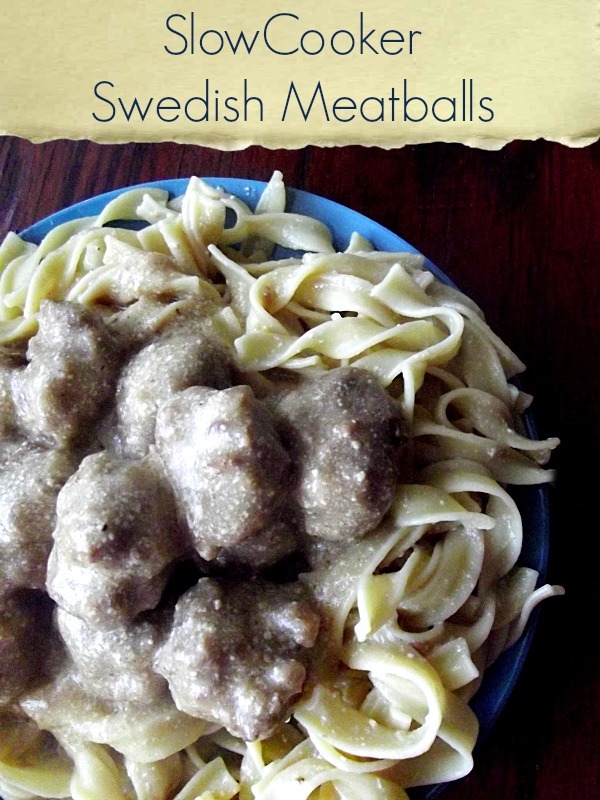 This recipe is really great and simple, you can make and brown the meatballs the night before, morning of, or even way ahead of time and freeze them till you need them. I usually make a double batch of the meatballs at once and freeze the extra for a super quick dinner another night. I thicken the sauce with a slurry of milk and cornstarch before serving then I ladle it over hot egg noodles for super yummy dinner! Mix the breakfast sausage, ground beef, grated onion, bread crumbs, 1/2 cup milk and some salt and pepper together and form into balls. Brown the balls in a skillet. If putting meatballs right into crockpot you do not have to worry about cooking them all the way through. If you are making the meatballs ahead of time or to put in freezer I would cook them all the way through. In the slow cooker whisk the beef stock and sour cream together. Add the meatballs to the slow cooker. When ready to serve mix 5T of cornstarch with 1 1/2 cups cold milk and whisk into slow cooker. Once thick salt and pepper to taste and serve over egg noodles. I really hope you give this recipe a try, it is a family favorite around here! Looking for more slow cooker recipes? Check out Dana from This Silly Girl’s Life recipe for Sticky Slow Cooker BBQ Chicken yummy! Want even MORE slow cooker recipes? Check back each Tuesday where we will be posting new slow cooker recipes or you can check out some of my other slow cookers recipes below! Mmmmm, I can just taste these meatballs! Thanks for sharing at Simple Supper Tuesday. Yum! This is seriously one of my favorites. I love anything with egg noodles, actually. :) AND I love anything in the slow cooker!! It really is time to break out the slow cooker… your recipes are great. Thanks for sharing with us on foodie friday. Slow cooker recipes are fantastic for this tie of year when the weather turns cooler but our schedules get busier. I can’t wait to try this recipe out. Thanks for sharing! Doesn’t the sour cream get lumpy or curdle if cooked that long? I’ve always been told to put it in last. Thanks again for sharing this recipe on my blog hop! Here’s a new blog hop for the week: http://contentemeant.blogspot.com/2013/09/what-are-you-doing-wednesday-blog-hop-19.html. Oh how I love Swedish Meatballs!! YUM!